While an engagement is a wonderful and momentous occasion that signals the beginning of something greater in two people, it can sometimes be trying to come up with just the right words to give to any friend that has decided to plunge into matrimony. This list of engagement wishes and messages is for those times, to inspire and help you. ♥ Allow me to be the first to tell you guys “It’s about time!” Honestly, I’m thrilled for you both and wish you the best in life. ♥ An engagement is the precursor to a marriage. By that token, consider my short wish a precursor to the praises I’ll say then. Well done! ♥ It is truly heartening that, in the world of perils and darkness, you two have managed to brighten it with future vows of love and light. ♥ Many say “I love you;” not all couples convey that message with palpable sincerity. This announcement only crystallizes that energy, which seems natural to you both. ♥ While I’ve seen many great and wondrous things in my life, the moment you guys followed your hearts and got engaged is definitely among the best. ♥ This joyous moments marks the point where you two tried out the appetizer before the entree of marriage. Remember to savor these moments just as well. ♥ Although they are made from links, chains only constrict a relationship. The threads of friendship and mutual understanding help tether a marriage to bliss and joy. ♥ While some may call me jealous for admitting you’ll spend more time with your fiance than us; truthfully, I’m envious you found someone who completes you. ♥ Congratulations! Omedetto! Bon chance! Mazel tov! Uh, I’m sure there are plenty of other ways to wish you guys success, but my heart outpaces my words here. ♥ I wish both of you the best of luck in your future endeavor. Feel free to send over the untouched libations, I’m sure I’ll be celebrating this for days. ♥ Some may say mathematics has no place in love, but you’d be hard-pressed to refute one plus one is everything and two losing one equals nothing. ♥ Love happens when two worlds collide and, rather than one being overtaken by the other and left in ruins, they are left connected and improved. ♥ We find tranquility in the people we give our hearts to and, complementary to that, we bestow that tranquility to those who choose to love us. ♥ Today marks the start of your life. How else could you describe your life after you decide to spend it with that one special person? ♥ One synonym for “engaged” is “occupied.” Remember this any time some friends or family try to wedge themselves into the life schedule you two have made. ♥ Here’s to the good times ahead with a person I know who will bring you more joy and fulfillment than that found in our strong friendship! 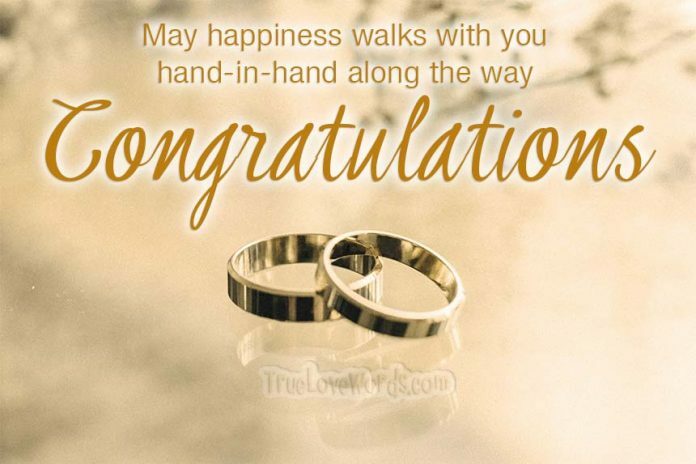 ♥ I want to wish you both great congratulations and I look forward to attending the proper ceremony that signifies the union of your lives and surname. ♥ Everyone endures weddings that they have no interest in attending. The good news is that your joyous occasion will be no such wedding for your friends. ♥ May God not only smile upon your union and the future wedding day, but may his smile widen greater than the smiles on your friends’ faces. ♥ Life can be trying living by yourself. Fortunately, the love you have in common should be more than enough to help you both weather life’s storms. ♥ Many well wishes to the both of you! Here’s hoping that the catering and drinks will be as enjoyable as the image of you both together. ♥ Congratulations on your impending nuptials! I tried finding a gift, but the sad, romantic truth is I couldn’t find something more perfect than your mutual love. ♥ Everyone knows the rules of “engagement.” Find the perfect partner, lead with your heart and come back with a ring as your trophy. Well done! ♥ You guys make the sweetest, most precious couple I know and you really put the “gem” in engagement. I wish you both nothing but life’s best. ♥ Here’s to you, the happy engaged couple, and to the hope that life will be easier with a second head resting on your shoulders. ♥ I’m a person of simple statements. You two are so perfect that engagement was obvious. All my praise for you! ♥ As two hearts come together, we wish you a life full of glitter and light. On your engagement day, we are sending good luck wishes and blessings your way. ♥ May the two of you have the best future together; we congratulate you for the great relationship that both of you have. ♥ We congratulate both of you on your engagement. May your future be filled with joy and excitement. Happy engagement! ♥ You make a wonderful pair. May you always be surrounded by lovely moments to share. Congratulations. ♥ As both of you are looking forward to your married life ahead of you, know that we are too. Your engagement has us filled with abundant happiness. ♥ May you be blessed with forever togetherness. Congratulations on your happy union, may you have many moments of joy and fun. ♥ As you are embarking on the new journey of your life, we wish to congratulate you on your upcoming marriage. Happy engagement! 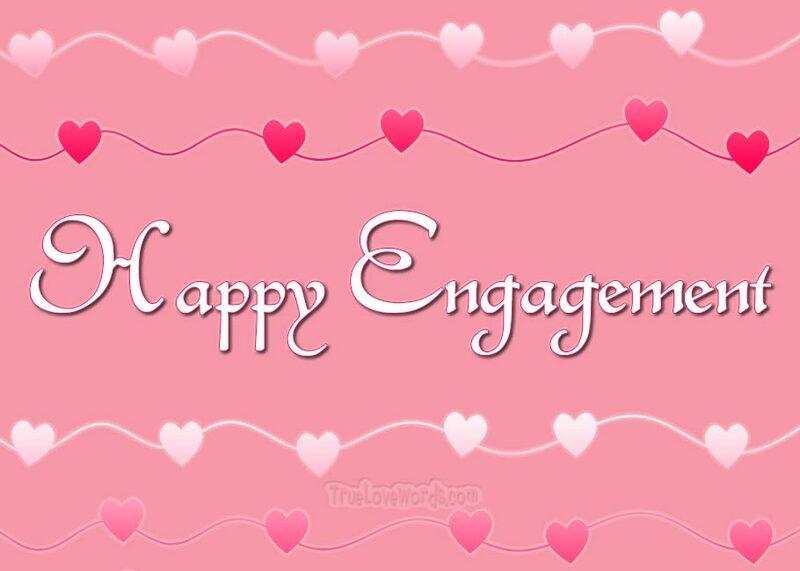 ♥ On your engagement, we are sending good luck wishes and blessings so that you have a life full of joy and excitement. Congratulations. ♥ May the love between the two of you become fonder and fonder. I hope you both have a blessed future. Congratulations on your engagement. ♥ Congratulations to both of you. You have found the person to spend the rest of your life with. Have a happy life together. ♥ Enjoy every moment you share with each other. 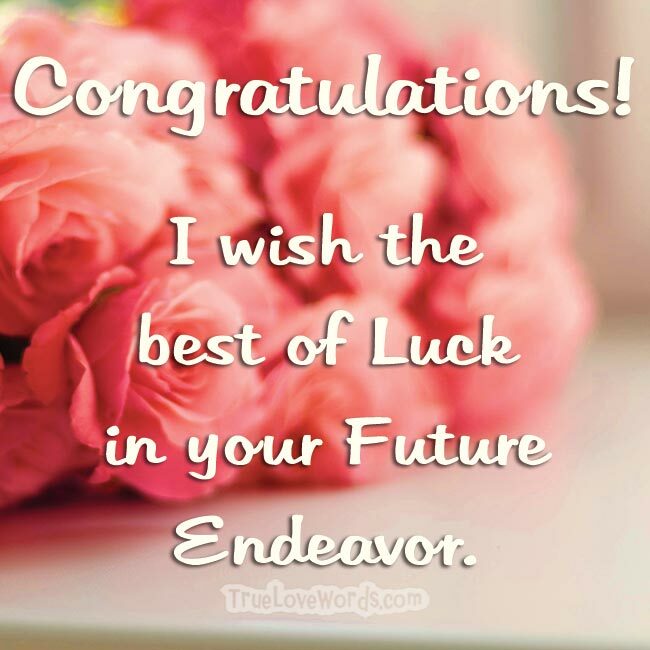 Heartfelt congratulations and best wishes for the future that lies ahead. ♥ May God bless you with a future filled with all of the happiness in the world. Congratulations on your engagement. ♥ Congratulations on finding your true love and I wish you a happy married life. ♥ Together, you can overcome all the troubles in your life. I hope all your joys will double in size. Congratulations on your engagement. ♥ Many congratulations on your engagement, I wish you the best of luck for your future. 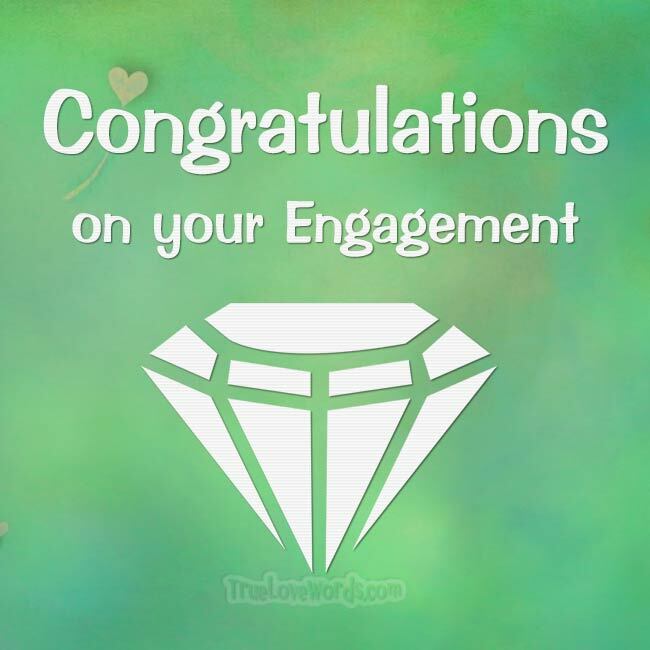 ♥ Congratulations on your engagement. I’m excited about the open bar! I mean the wedding day! ♥ You’re both so lucky to have found the one person that you want to annoy for the rest of your life. ♥ Congratulations on your amazing and beautiful engagement ring! Oh, and your fiance seems nice too! ♥ Well done on avoiding being a crazy cat lady. ♥ Never laugh at your partner’s choices, you are now one of them. You’ll be more effective for him. ♥ Remember to pray with each other and for each other. Prayer is the key to keeping focused on what is most important in your lives together. ♥ We are excited about and looking forward to finding out what God has in store for you. We know that His hand will be upon you and His spirit will grant you the wisdom you need when you need it. ♥ Jesus loves the church as his bride. His love is an example for us to use to model the kind of love that it takes for a good marriage. ♥ As Christians, we know that we are sinners and that God still loved us. Keep this fact in mind in your marriage to help you stay humble and love unconditionally. ♥ When two are married, God becomes the bond between them. Let no man separate what God has joined. ♥ We are confident that your marriage will be stronger because we know that you two are strong in your faith. Remember your faith and trust in God in the times you need it. It will help you get through the challenges you will face together in life. ♥ Marriage is about trusting, sacrificing, and forgiving. Jesus is the ultimate role model for how to behave in your marriage. Remember to pray together often so that your values, goals, and dreams will be made together with the guidance of God’s wisdom. ♥ The Bible says, ‘two are able to defend themselves.’ Just don’t forget that you are on the same team, and no one will be able to conquer you. Together you will be strong against evil. ♥ When… and not if you guys fight, remember that Jesus is in the room with you. This way you will have the love, respect, and humility that it will take to love each other when you are not lovable. ♥ May you always walk together hand in hand, while trusting in the grace of God to lead the way. ♥ Rejoice in your love and may God bless you now and always. As you become one in Christ, we wish you love and joy. ♥ God has so many amazing things planned for your future together. Enjoy every single one of them. ♥ Seeing you two make promises and step forward into the future is so inspiring and wonderful. ♥ If ever two people deserved a meaningful, joyful wedding day, it’s the two of you. ♥ God bless you both as you begin this wonderful journey of marriage together. ♥ Be happy, be grateful, and love each other well! ♥ I just know that life has even more wonderful things in store for you two. May every day be happy and beautiful for you as a couple.